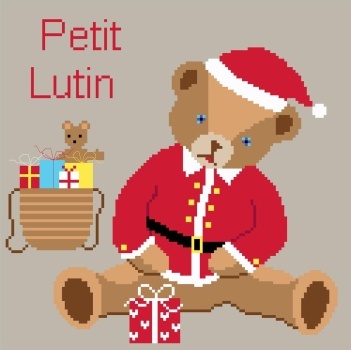 "Christmas Teddy" is a cross-stitch chart with instructions translated in English. It is part of a Passion Bonheur collection comprising more than 30 patterns. All of them can be ordered on this website but for some of them delivery will exceed our usual standards. Delivery time for this pattern: usual. Browse the complete Teddy Bears Collection here. This patterns show 11 colours (DMC references on the key). Recommended Fabric: 14 count Aida (or 28 count evenweave or linen), colour "Natural Linen" 40x40cm (16x16 in). This product is a cross-stitch chart + instructions translated in English. Usual delivery time.